What about some math for preschoolers? Sounds serious, right? But let's relax. We'll only pick favorite toys and go from there. Read on if you need an idea for toddler play - sometimes we run out of ideas for toddler play, right? Well, it's play time again! 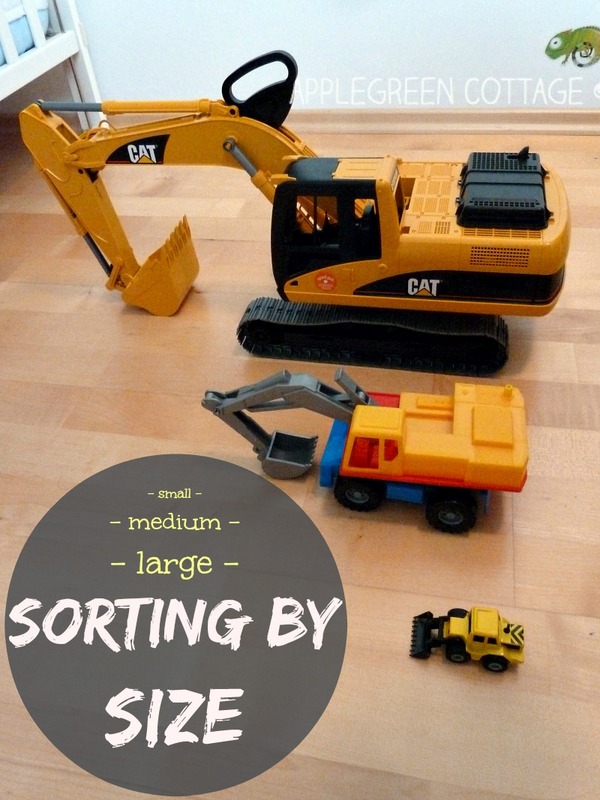 Sorting is one aspect of early math that can be applied to nearly any materials (just have a look at Montessori sites), but to spice it up, you might even use the kid's toys. If you select objects that are similar in function or appearance (all balls, or all teddybears, or all minky toys, or all plastic boats, etc), they can be easily used in this early math activity. your toddler's favorite toys. In our house, there is no doubt: trucks. So I took three of the same color from the arsenal of his trucks and gave it a try. And then he ran away with the largest truck of the three. No time to talk anymore, it was play time. That's a great idea! I will be doing this activity with my 2 year old! Thanks for sharing! thanks, and happy to hear that. Sometimes simple ideas are the best way to go, right?